CHIAVARI, Italy – After starting my Italian life on the sunny Riviera where things are popping in the summertime, you can imagine my surprise to find that in other parts of Italy, life in the summer is quite different. For example: when I moved to Milan I found myself living in a concrete jungle that was bustling and busy in July, but in August it was as empty as a dried out bee hive. I woke up one morning and Milan had been evacuated. Every business around my apartment had closed and “Chiuso per Ferie” (Closed for Vacation) signs had suddenly sprouted up everywhere. After a few days, I started to worry. The cupboard was getting dangerously bare and there was not a sighting of anyone selling food anywhere. What to do? I took to the quiet, traffic free streets and began wandering up one and down another, dragging my empty grocery cart foraging for food like a Neanderthal housewife. There wasn’t even a bar open in my neighborhood where I could get a sandwich. I was starting to question the wisdom of moving to Milan. The plummy job offer I had received wasn’t going to do me much good if I starved to death over the summer, now was it. I was down to my last can of tuna when I discovered that as a public service, the Corriere della Sera, the local newspaper, published lists of the grocery stores in Milan that were open in August. There were only a handful of them, mostly in remote neighborhoods I had never heard of. And I’m not talking mega-super marts, I talking mom and pop shops that were so small they only had room for 5 cartons of milk and half a dozen loaves of bread. In other words, get there early. To be honest, that was at the end of the 90’s, and things did improve with time. But not much. So, in the name of the Freedom of Information Act – which doesn’t actually apply here in Italy, here’s a list of bars in Milan that make it a point to be open in August travelers who think mid-August is a good time to visit the city. Like the Corriere della Sera’s list of grocery stores that were open in August, it’s a short list and not in any particular order. I’m just thrilled to have a list. For certain there are other places that are open, you’ll just have to pretend you are on a city safari and seek them out. They would like you to think all the shops along busy Corso Buenos Aires are "open all year", but they are not. However, Pattini is. This bakery/bar offers bread, foccacia, cakes of all types – which you can also buy by the slice, and of course that cornerstone of Italian breakfast, that bit of uber-deliciousness the French call croissants, our one and only Italian brioche/cornetti. You know the ones I mean. 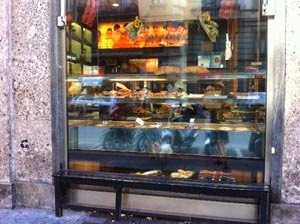 Those horn shaped pastries that come with a shot og custard or marmalade indifr. Or sometimes, if they are whole wheat brioche, they are filled with honey. Or just plain. Who can resist? 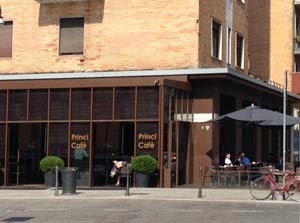 In Piazza XXV Aprile, Princi is always open. The baker is always baking, the bar man is always doing what bar men do. On offer, along with bread, foccacia and fancy cakes you can have a coffee or a nice cup of tea or even snack or an aperitif. The cocktails are summery and pretty with lots of fresh fruit. 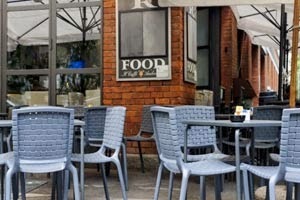 You can sit out on the terrace and enjoy the quiet of summer in the city in August. As they say in Italian, “si sta bene”. Elletrauto Cadore, as the name implies, was once a garage. Now it is a cool place where you can have a cocktail, light lunch or a cup of coffee. The happy hour buffet, along with the usual pieces of foccacia, salami and cheese, offers something new – something new for Milan at any rate - chicken wings. When the weather is nice, you can sit outside under the umbrellas. If you have a good imagination, you can pretend you are on vacation. Aperiterme is QC Terme’s name for their happy hour. It’s held in the garden and afterwards you can sit in the sun and work on your tan in the large outdoor area, or have a facial, the new one that gives light and energy to tired skin (their words, not mine). Or, it might be the neck massage that gives the light and energy, and with all that new energy you can take a dip in the pool which is open until 12:30 AM or, head for the sauna. At any rate you’ll surely be transported to faraway places by the scent of garden flowers and lavender, and who knows, you just might forget that you are even still in Milan.